It’s suddenly the time of year for thinking about planting pots, tubs, window boxes and hanging baskets with summer bedding plants. As usual there’s a vast array of plants appearing on the market as well as the containers to put them in. The idea behind summer bedding is to introduce quick-growing plants that (hopefully) flower madly through the warmer months of the year right up until the first frosts. The added bonus of container grown bedding displays is that they can be moved around the garden as we please, placing pots full in the garden where perhaps there are currently no flowering plants or using them to draw our eye to a pleasing feature. 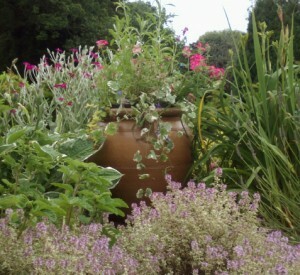 However, the downside is that during those colder months when the bedding has ceased, we are left with empty pots. Spring bulbs and such as wallflowers can provide colour but for a more permanent display the use of evergreen shrubs and grasses can provide year round interest. More importantly they can be used to great effect when used with spring bulbs and summer bedding – using elements from different seasons to create a continuation of colour and form through the whole year, pots need never be empty again. Plants that look good with summer bedding include Heuchera ‘Palace purple’ with deep purple foliage which likes semi-shade so it can be grown in a pot with Fuchsias, Begonias or the tabacco plant Nicotiana for a good display somewhere in the semi-shade. These bedding plants are available in a wide range of colours but a deep red display with the Heucheras can be created and also Euonymus fortuneii can be planted too which will add year round colour – when the bedding is discarded in autumn then bulbs can be added for a spring display of small bulbs with the Heucheras and Euonymus. The pot need never be empty. Ivies are a favourite plant for trailing from hanging baskets and window boxes. Use a yellow-variegated variety in a sunny position to give added colour to a scheme. Working well with just about every possible planting, ivies look good in threes or fives for continuity. Also try the periwinkle, Vinca minor rather than the larger Vinca major, these compliment spring bulbs such as the Grape Hyacinth both blue and white and look good in summer with the white daisy-like Marguerites. Grasses are a good choice in a sunny position giving an unusual added dimension to summer bedding, and why not? A white colour scheme of summer bedding with green or bronze grasses which can be found cheap at nurseries as small plants, these will also look great in the spring with small daffodils or snowdrops. Whatever you are planning on planting this summer, remember that it’s worth seeing what’s available at the nurseries to go with the summer bedding. Don’t be afraid to try plants together at the nurseries and see what does look good. Shrubs are also an investment and once they outgrow their pots they can be put in the garden to grow and give pleasure for many more years, bedding plants are however more short-term, here to brighten our gardens and give an instant splash of colour for the summer months.